At Tullipan Homes, we are proud to have exceeded the expectations of hundreds of clients in designing and building their dream home. Below are some of the experiences that our clients have shared. We are happy to provide access to clients with homes currently under construction (with our clients' consent) to provide you with opportunity to discuss our level of service and focus on customer satisfaction. We had a hassle free, stress free and smooth process during the course of building our house. They were very flexible in making genuine changes and customising the floor plan. There was excellent communication between the team and us throughout the process. It was a full turn key project. Adam promised that he will do this house as if he was building his own house. And Tullipan homes has built us a quality home in 5 months!! Thank you, Adam, Jacob and the whole team involved in building our dream home. We recommend Tullipan Homes to all. This letter is somewhat belated, to which I apologise. It has been six months now since we moved into our home and I would like to formally thank and congratulate you and your team for delivering a truly outstanding result, on time and within a budget. The initial design work done with Mark was invaluable. He took our ideas and sketches and created our home. I cannot speak highly enough of the design process; Mark offered practical advice backed by a sound engineering knowledge and building processes. He was also able to provide subtle inputs which whilst in isolation may have seen small at the time, have had a huge and lasting impact on the final result. Rodney and Daniel did a fine job come construction time. From the very first day that foundations were being dug, we had 100% confidence in the process. I recall saying to my wife on that first day “thank goodness we’re with these guys and not the first builder we had engaged”, who have subsequently gone under. For us to have such a high level of confidence in your team throughout each stage of project is to be commended. The amount of organisation and control that Mark, Rodney and Daniel had over the process was first class. Lastly, I am sure given the site complexities our project was probably referred to as the “house from hell” in your office. However at no point did I get this impression from anyone we dealt with and nothing was too difficult. We thank you for your efforts in ensuring that seemingly impassable roadblocks were cleared quickly and with little fuss. Mary’s input into the services/council issue made the world of difference. It is to that end that I am happy to provide Tullipan Homes with my highest recommendation for any home building and design work, be it from small projects to large scale luxury residences, on the most complex of sites. From the very start we felt very comfortable and confident with the level of expertise, professionalism and friendliness of Tullipan staff. Nothing was ever a problem and everything was transparent. We made numerous changes before and during the building process, and these issues were handled quickly and communicated articulately. Jordan, our building supervisor is an asset to Tullipan Homes. While we had our fair share of building issues, Jordan and Tullipan addressed and solved all of our concerns, providing advice and guidance during the whole building process. To his credit, Jordan continues to provide assistance with after building support and service. The build was managed very well, considering the slope of our land. From excavation to completion took only six months, including the Christmas break. This is the fourth house we have built and by far the most relaxed, exciting and enjoyable. Before meeting Tullipan Homes, I had previously built a new, architecturally designed, waterfront home only 9 years before. That was a good experience, and gave me a good reference point with which to make this testimonial. The building we eventually settled on was massive - a six bedroom, two storeys, 4 car garages, 550sq metre monster. On a prime waterfront block at Booker Bay, so we felt some pressure to get it right. It was a big project, and we always had some doubts about our final vision, but Tullipan were happy to furnish us with NINE separate and unique plans (some at short notice) to make sure we were happy with the final outcome. I actually felt sorry for their draftsman at one stage, but the office just stayed right on the ball until every detail was sorted. The initial contract fee for the basic building was very competitive, but I knew we'd add much more with our inclusions. The selection process went very smoothly, and we were given as much information and help as we needed. I'll admit we were a little disorganised at some stages, so some of our final decisions were made very late. But all advice we were given proved to be spot on, and every selection we made went it into the project on time and at the quoted price. I think the strength of their business is their size. Not to big for you to be a number and not have your concerns meet sympathetic ears. But not to small as to lose economies of scale and efficiency. The office has great administrative procedures, and sticks to them. 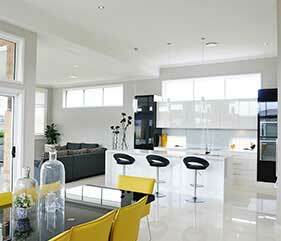 I'd have no hesitation recommending Tullipan Homes to anyone thinking of building, big or small. Thanks for building the home for us. We are very pleased that we have engaged Tullipan as our builder. From the look and material used from the outside, the quality is much better than other 'bigger name' builders. And we have a family friend who is in the construction industry who praised about the small details in quality material used for our build. I have been very impressed with Tullipan, right from our first interaction with them and all the way to delivery of the final product. The whole business is family owned and managed, and I have seen great teamwork in action resulting in a home that we've always dreamed about. The house was difficult to build, especially because of Mine Subsidence restrictions. The final custom design was something we were extremely happy with. They also built a pool house for us in a very difficult spot. Mark and Shona navigated the council and Mining NSW bureaucracy very skilfully, such that we got the approvals we needed. Jess and Neil handled our individual selections very professionally, despite our many changes. It was then up to Jacob to supervise the whole build, and he did that very very well. He gave us constant updates, even when overseas. We had several on site meetings with him, and went the extra mile to make sure we were really happy. Requests for variations were handled very fairly, mostly by Adam. Pricing was always reasonable. After handover, minor issues were dealt with promptly by Jacob and Adam. The boys even turned up on Easter Saturday to look into a dripping water pipe in the garden. In the end, we now have a stunning home that we absolutely love. Although I'm no expert, several tradies and other friends in the construction industry were very impressed by the quality of the build. That's very comforting, and priceless! From our first meeting with Mark until our final handover with Mary, Tullipan Homes could not have done anymore to facilitate and expedite our construction. The two big factors for us were the excellent on-site communication and the outstanding service provided by all the staff at head office. Any problem or question was dealt with in a friendly and timely manner and the finished product, being our new home, is outstanding. I spent quite a lot of time on-site and nothing was too much trouble for Daniel, our site supervisor. So thank you Tullipan Homes and a special thank you to Mary, Rodney, Mark, Daniel, Jordan and all who contributed in building our new home. We would have no hesitation in recommending Tullipan homes to anyone who would like to end up with a home of outstanding quality. We were looking for a 2 story home suitable for our small lot in Fletcher. Tullipan Homes had a plan suitable for our lot leaving a decent backyard. It took only 5 months to complete the house. Thank you Bob & the team for building our dream house. We are the only one with a key in this street. We appreciate the team work. After being knocked back from 2 big builders because it was all too hard to access a busy main road Tullipan took on my project of building a main house and granny flat. The whole experience and process was great, nothing was a problem, communication was great always contacting me with any changes or problems that came up and solved any faults quickly throughout the build. The workmanship was of high standard and good quality. 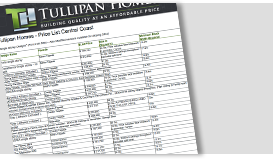 I recommend all to Tullipan Homes to build your new home. After years of planning and designing our new home, the time came to select a builder to bring our dream to life. This was one of the biggest decisions we had to make, and we met several high quality custom builders locally, in Sydney and explored the national building companies before our meeting with Tullipan Homes. We realised the dedicated team at Tullipan Homes could provide the perfect balance of a custom building experience with the logistic support and efficiency of a large building company. This incredible team of people lead by Rodney, Mark and Daniel fulfilled every item on our wish list, with all the patience, dedication and skill you would expect from a custom home builder. They are passionate about building high quality homes and the client is the centre of everything they do. Nothing was too much trouble, despite our extensive post-contract variations and complex electrical and data requirements. The administration staff were highly professional and patiently worked through a long list of custom finishes and detailed changes to the original contract as the final style of the home evolved during the build. I received excellent advice from Rodney, Mark and Adam on many of these decisions and improvements to the original design of the home itself were made based on their extensive experience. The tradespeople and contractors onsite were equally professional and experienced, and their high quality work was observed by my independent certifier during the building inspections. The entire team treated our home as if it were their own. The complete transparency of our fixed-price contract and real-time costing for each variation we requested gave us control over our expenditure throughout the build and peace of mind. Communication on the day-to-day build process was exceptional, my phone calls and emails were always answered immediately or shortly afterward. Site meetings with Rodney or Dan were easily arranged when required to work through more complex items. This made the 12-month process as stress-free as possible and a very positive experience despite the inevitable challenges of building a large home on a steep slope with various site restrictions. Very satisfied customers of Tullipan Homes. Our home was complete in 7 months, communication with members of their staff was prompt, factual and always professional. With no experience in building their ability to guide and advise on products was invaluable. The experience was positive on all accounts and I wouldn't hesitate to build with Tullipan again or recommend them to anyone looking for a residential builder. We had the smoothest building experience with Tullipan building our beautiful new home, every person we dealt with went beyond to help us at every step. Everything is top quality. We are so happy with the end result, our new home is so beautifully built and we so proud to show it off. We would go back to Tullipan if we decided to build again and have recommended them to everyone. Building with Tullipan was a great decision. The whole process from the very beginning up to handover was easy & stress free. Having a rather steep sloping block most of the major project builders weren't interested but with the many Tullipan designs to choose from we found the perfect one to suit our site. By making a few minor design changes to the original Sienna MKll we made it uniquely ours. All of the staff that we dealt with from the front office to on site were extremely knowledgeable & polite. No question ever went unanswered, no query was ever a problem. Based on our experience we highly recommend Tullipan Homes. 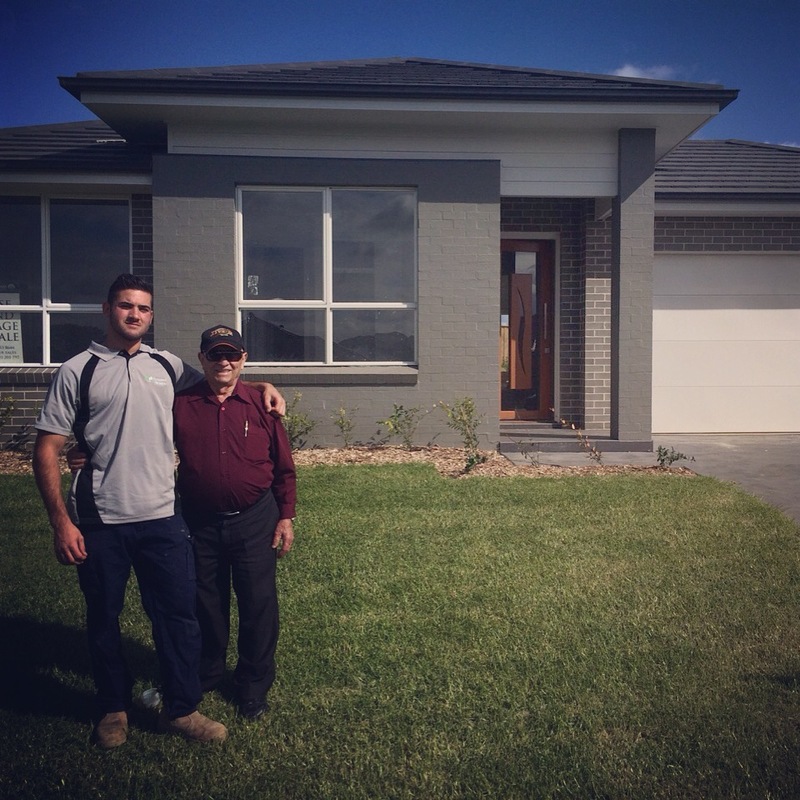 We couldn't be happier with the process of our build with Tullipan Homes. This was our third build and by far the easiest, least stressful, smoothest process of all of them. From the beginning in our first meetings with Jamie, he was so transparent through the whole process and really helpful and accommodating with our custom design. The workmanship of the property is of a very high standard and our Foreman Jordan Tullipan had a great attention to detail, communicated well and no question or request was ever too much trouble. Our build was completed ahead of schedule which was just amazing! Our contract was 8 months and it was completed in 6 months including their break over Christmas. We built in a flood zone and had some unexpected costs arise during the planning and beginning stages of building, yet they were upfront, clear about our options and we feel like our house is built up to the highest standard. We honestly couldn't fault anything in our experience with Tullipan Homes. They were transparent with every process, communicated well, organised, incredibly professional and the final product is our dream family home we have been working so hard for years. If we were ever in a position to build again, we would not build with any company other than Tullipan Homes. Thank you so much to the Tullipan team. Our new family home and the process to get here exceeded every expectation! Our experience in contracting with Tullipan Homes on our first (and probably only) new build home has been an entirely pleasurable one. The consultative professionalism was obvious right from the early planning stages of our custom house design with Jamie, Mark and Shona and the rest of the team helping to minimise what could have been a stressful process. The build itself was completed by Jordan and his on-site team inside 6 months - ahead of schedule. We were reasonably hands-on clients, staying close to the build to ensure that some of the unique design elements were executed to plan. Not only was this not a problem but we got the feeling that having interested and engaged clients actually helped the build. The major feedback that we gave several times during construction as well as at the end is that for house-build 'newbies' like ourselves, sometimes you don't know what you don't know and the builder should take that into account - which Tullipan usually did. Similarly, while we were happy to engage our own Colour / Lighting consultants etc, custom build clients can appreciate the builder having some connections / referrals in this area. The quality of build from Tullipan has been almost faultless and any minor rectifications have always been attended to, often with personal oversight by Jordan and Mary - even some months after handover. Overall, 2-way communication was excellent throughout the build and ad hoc site visits were never an issue. We are delighted with our new home and apart from slightly over-extending ourselves with separately contracted landscaping, to maximise the combination of our view and Tullipan's excellent design, there were no real financial surprises. Our new house is also meeting with approval from our children, grand-children and ageing parents and we look forward to it being a true family home for many years to come. Well here we are again having another Christmas in our lovely home you built for us. The more we do around the place the more we love it. Wishing you all a very happy Christmas with your loved one's may 2013 be a very good year to you all. We have recently moved in to our New home built by "Tullipan Homes"
(Almost 3mths ago now) I wanted to write a review on Tullipan as soon as we moved in! But I thought it best to wait & give a real honest review after the “New experience” had worn off. In the beginning we had not heard of Tullipan homes, we favored the larger builders because that was all we new? People ask me now, how we found out about Tullipan homes? Well it was from word of mouth! Good old fashion grape vine! I just happened to play tennis with someone who built a home at Daley’s point. Builder happened to be Tullipan, I made a phone call & the rest is history. I still remember Mark & David standing on our land debating which side the balcony should be on, I knew then we had the right builder ! The time taken to get the design right for the block is so important & it shows now. From design to handover it was never stressful. They have always been honest & disclosed all relevant information. Everything just worked!! There are builders who just build houses, & there are builders who have vision, to create something special for you on your block of land!! In our case the view was so important. That to me describes Tullipan, a very in touch builder who is more interested in building a house that works for you. It is important to understand that building a house is one experience, maintenance & warranty repairs that may be needed after the home is built is another. How well the builder responds after the house is handed over?? Let’s face it, we have all heard the horror stories after hand over from other builders about repairs or general warranty claims & the builder simply washes his hands of all responsibilities. Usually after 3mths you really start to know your home, & because you are so excited at hand over you tend to generally miss a lot? But I can say now there wasn’t a lot to miss. 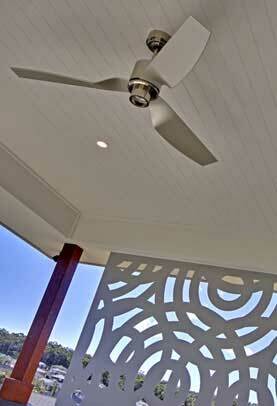 The Tullipan home stands tall on quality, but the real workmanship is in the structure of the home. There are no noises in the floors from settling timbers it’s solid & sound. Quality, Workmanship, Design, Helpful, Honest & Professional the 6 words that comes to mind when I look back on the Tullipan experience. So we to will join the Grape vine & will spread the word. After building a new home ask most people if they would build again? I don’t know anyone who would? But if you ask me, my answer would be; I would build tomorrow with Tullipan, without a second thought! We couldn't be happier with Tullipan Homes. Jacob and the team went above and beyond expectations building us our family dream home. The build time was right on schedule even though we had the damaging storms right in the middle of construction. Outstanding quality, honesty, great communication, and attention to detail is what sets this family run business apart far from the rest. We would have no hesitation using Tullipan again and recommending them to anyone in the future. This was the first home building experience we had, couldn't be happier with the end results! The community titled block we bought at Murrays beach had so many restrictions, it was a hot potato, that only a handful of builders were willing to take on the project. After wasting six months with another builder, who couldn't get the design right, we came to Tullipan. Our first meeting at Tullipan was with Mark, he was professional and honest. Without using any fancy software, we were so impressed that he came up with a brand new design by just using scissors, glue, a pen and a correcting tape! We were able to communicate our idea as he was cutting and pasting to form the draft plan. There were some hiccups with the DA, with our initial submission being knocked back. Again Mark worked after hours changing the design to make the house more 'articulated' as recommended by the town planner. He also gave us some really useful advice on dealing with the council. After a few rounds of negotiations and a one off meeting with the town planner, our application was successfully approved without too much compromise. We were the first house at Murrays beach water front that was sitting on a slab instead of a bearers and joist structure, huge thank you to Mark and his team! After signing the contract, we were given a building period of 40 weeks. The building process went extremely fluent, the house was finished within 5 months! The site supervisor Jacob was very efficient, thorough, and helpful with our questions. He always rang us back if he missed our calls. The finishing of the house was perfect, with every mark on the paint every loose screw repaired prior to handover. The end result of the house was beyond our expectation, as recommended by Mark, we used a colour specialist to choose our exterior colours. Having doubts of the combination in the first place, the house turned out to be absolutely spectacular. Without the sales gimmick, all cost and variations were transparent, we didn't pay a cent more to the contract. In 2015 we signed up with Tullipan to build our large 40square house on a fairly difficult sloping side. The design process with Mark was excellent. He really worked with us in several meetings on the plans until we finally had a good design to submit to council for approval. Council came back with further changes and Mark adjusted the plans again, and in the end we had a four level design that would give us beautiful views over the valley. We signed our contract in early December 2015 and excavation started immediately. For the time of the built we lived and worked overseas and had only friends and Tullipan to report back to us on the construction process. Everybody had warned us, that it would not be a wise idea to go overseas whilst building, but we could not change this, we had to trust Tullipan. We had all the selections done and were pretty confident that we had covered all the basics. Initially, we got slammed with the cost of expensive retaining walls which had not been budgeted for. They also delayed construction. When my husband inspected the site in March, hardly anything had happened with the building and we got a bit worried, since Mark had told us that they usually finished their buildings well ahead of schedule and we had scheduled to move in July. By June only the frame had been built and it was clear that we would not be able to move into the house on our return from overseas. We finally moved in mid-September, a day after the contract ran out. Despite the longer building time, we are very happy with the quality and overall cost of our house. Since Tullipan use quality inclusions, there is not a lot of necessity to upgrade to more expensive inclusions. We mainly spend a bit more money on the kitchen and the lighting. We paid the price that was given in the contract. There was blow-out of costs as we had heard from people with other builders. Once we had moved in, any other minor issues that came to our attention in the first few weeks after moving in were quickly remedied a few days later by Dave, their friendly and knowledgeable handy man. We have now been in the house for almost 9 months and have not had any issues with the building or inclusions/kitchen/bathrooms. The ducted air con is really good and the house seems well insulated. We are confident that we made the right decision to have built with Tullipan. They are knowledgeable, professional and easy to deal with. Mark and Daniel, our site manager, did a brilliant job, were always free to meet and the people in the office always responded quickly and were helpful. We would build with them again. If you got a difficult plot, Tullipan should be top on your list to talk to. It is human nature and easy to be critical of anyone...especially Home Builders - but there are always genuine exceptions and would like to share our positive experience in building a new home. I am writing you this note to let you know how pleased both Gurnam and I are with our new home and the experiences we had working with Mark, Rodney and his son plus your staff at TULLIPAN Homes. Initially, the construction process did not proceed smoothly with some Supervisor issues. However, to Rodney Tullipans’ credit, he rectified the situation immediately - and then personally ensured that the building process was accelerated and had the house completed on time. The Tullipan family obviously takes pride in the homes they build and are very focused on customer satisfaction. This is actually true, as there have been numerous minor issues that had arisen after occupying the home for the first 2 years. However, to their credit - on every single occasion Tullipan have responded and sent out their contactors to rectify these issues. They were extremely responsive to our concerns while the house was being built, but continue to resolve the few issues we have had since we have moved in. Again, they were extremely responsive to our needs throughout the building process and worked diligently with us to get the house completed on time. We look forward to many years of happiness in our new home. I don't know if we'll ever build another home, but if we do, we will definitely consider TULLIPAN Homes first. Further to our site meeting and handover today, I wish to confirm my appreciation for the excellent job carried out by Tullipan in constructing my new home at 182A Araluen Drive, Hardys Bay. The build has proceeded smoothly and to a high standard of workmanship as every member of the Tullipan team has been very competent, easy to deal with, and eager to please throughout the entire contract period. I will be pleased to recommend Tullipan to others. We get so excited to know you guys are following our trip. And we would also like to say how grateful we are that its you guys looking after our house, with all the dramas and extra cost, we feel we have been very looked after, which has relieved a lot of stress, that we may normally have felt, which could have altered our awesome Family Time. Now that you have completed our house at Bonnells Bay, we would like to thank you for doing such a fine job and within the estimated time period. Every member of the Tullipan Team that we had contact with was courteous, friendly and most helpful and the whole experience was quite hassle free. One of the main benefits of building with a family business such as Tullipan was, we found, the advantage of on going interaction that was possible. You were available to answer our questions, discuss and make changes and advise on various options. As you are aware we originally had plans drawn up by one of Sydney’s larger project home builders but lost confidence in them after passing from the initial salesman to contract staff at head office – at this point it was virtually impossible for further discussion and advice. Mark, you designed a magnificent house on a narrow block and taking full advantage of the views. The quality and attention to detail is exceptional and we would not hesitate in recommending Tullipan Homes in future. Just a quick thank you, for your’s and Tania’s assistance last night. Once again Tullipan Homes have impressed both Sherene and I with your professionalism. Your reading of the situation and the summation by Tania ensured that our approval was secured. Thank you again and I look forward to our on going working relationship. I just wanted to say a huge thank you on behalf of Brett & the family & me! We feel very lucky to have your family and team looking after us. We love our new home and we particularly love that you all seem to care so much for it as well! The guys on site have been very helpful, friendly and welcoming, its been great. We are really excited about the new year. Thanks for giving us that. Please pass on our best wishes for a great Christmas and new year to all of your family and staff. Dear David and all the Team at Tullipan. Thanks so much for getting us into our house early. We certainly appreciate all your effort & we are thrilled with our house. Thanks guys for building a fine house for us and well done getting it finished on time. Thanks ladies for all the support work necessary. On behalf of our family I would like to thank you and your company for the speedy completion of our Home. Also the high degree of workmanship of all concerned in the fit out and construction. This was not just a house but a well built Home that we can truly be proud of. I would recommend your building expertise to anyone who desires to have the best home in any street. Once again thank you very much. Warren & I would like to thank the Tullipan family and staff for their workmanship and manner working together in building our home. Once again thank you all very much. We love our new home & we just want to say what a pleasure it has been from start to finish having you all involved in the building of it. We wish all things in life were as hassle free and rewarding. Thank you guys for all your hard work & dedication, the end result says it all. We would like to take this opportunity to thank you, Mark, Personally for helping us out from that first time we met you and you were willing to help us with our sloping block of land and no other builders were interested. You came up with great ideas for the floor plan and design of our house. I would like to also thank Rodney for his great site work and for always being more than helpful when the house was being built. We have received a lot of favorable comments from neighbors as well as your own sub contractors about how nice the finished product is. We would highly recommend your company to anyone in the future. Could I take this opportunity to say that all of the staff at Tullipan Homes have been most co-operative at all times to the numerous telephone and personal contact I have had. Not once did I get the impression that I was a bother, even though at times they may have felt that way. The friendly attitude and advice is received from the instant the telephone is answered and I am always greeted with a smile. This is very rare these days and I Know your staff have been at a loss to understand why this matter has been dragging on. They are to be complemented on their Knowledge and not at any time was I treated without respect. To David, Mark, Rodney, Daniel, Malissa and Mary....and all of the boys that worked on our home at the various stages. When we decided to build our new home and chose Tullipan Homes to do the job, our friends asked us who are Tullipan Homes? At the time we really didn\'t have a lot to tell them, other than the fact that Tullipan was a local, family owned and run company, and that we felt an immediate sense of trust and integrity from the very first meeting with David, a gut feeling you might call it. Anyway now that our home is complete the answer to that same question is very easy. 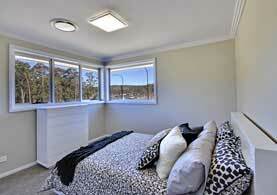 Tullipan Homes are the best building company on the Central Coast. In all our dealings with the "Tullipan Family" we found every member of the team to be straightforward, honest, very efficient, and pleasant throughout all phases of the project. With very little building knowledge & understanding, we felt extremely comfortable in letting you do your respective jobs, and at the end of the day we truly believe we reaped the rewards of letting an extremely effective team of people do what they do better than most. The finished product, our home, is testimony to that. One thing that really struck us, and we would like to make special mention of, and it was something that really encouraged us during our visits to the site, was the quality of the various trades that we met. But not only that, the guys that you had working for you were all very happy and seemed to enjoy working for you. We think this speaks volumes for the way you operate your business. Finally, to the "Tullipan Family" we would like to extend a sincere and warm thank you, for not only building a wonderful home, but for making the experience an enjoyable one. We think that is the way it should be. And on that front we know you agree. PS> The newly born twins Georgia & Jack also thank you very much for their wonderful new home. 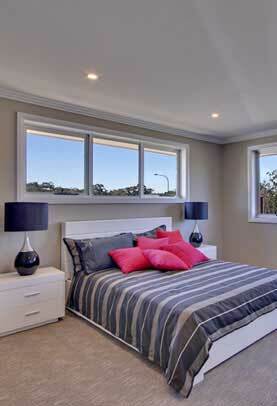 It is now 12 months since the handover of our home in View Point Drive Toukley. I have now finally retired and at last have a chance to write and thank you for the spectacular home you built for us. As you know I am a builder, have worked solely in the eastern suburbs of Sydney for 50 years and have been fully occupied up to now. From the first meeting with Mark, to design, combining our ideas with yours, council approval etc, everything worked perfectly. The building phase was efficient and continuity of trades was faultless. There were a few minor hiccups but these were overcome with a phone call. The tradesmen ranged from excellent to efficient and being a builder myself I know how hard it is to keep teams of tradesmen completing work to your own expectations. Our home was completed to handover in less than 12 months. Everyone at Tullipan was helpful, easily contacted and responded to any enquiry quickly. It was a great experience being from a family company myself to see a family building business carrying out work to a high standard in such a professional manner. Our home is now furnished – there is still work outside on the waterfront that I need to complete, but would welcome anyone from Tullipan to inspect our beautiful home. Should any future customers need to inspect or need our recommendation we would be pleased to do this. After years of planning and designing our new home, the time came to select a builder to bring our dream to life. This was one of the biggest decisions we had to make, and we met several high quality custom builders locally, in Sydney and explored the large national building companies before our meeting with Tullipan Homes. We realised the dedicated team at Tullipan Homes could provide the perfect balance of a custom building experience with the logistic support and efficiency of a large building company. This incredible team of people lead by Rodney, Mark and Daniel fulfilled every item on our wish list, with all the patience, dedication and skill you would expect from a custom home builder. They are passionate about building high quality homes and the client is the centre of everything they do. Nothing was too much trouble, despite our extensive post-contract variations and complex electrical and data requirements. The administration staff were highly professional and patiently worked through a long list of custom finishes and detailed changes to the original contract as the final style of the home evolved during the build. I received excellent advice from Rodney, Mark and Adam on many of these decisions and improvements to the original design of the home itself were made based on their extensive experience. The tradespeople and contractors onsite were equally professional and experienced, and their high quality work was observed by my independent surveyor during the building inspections. The entire team treated our home as if it were their own. The complete transparency of our fixed-price contract and real-time costing for each variation we requested gave us control over our expenditure throughout the build and peace of mind. I wish to thank the entire team, and in particular Rodney, Adam, Mark, Jesse, Jordan and Dan. It was so lovely working with you all. Your unwavering determination to achieve our goal was outstanding, you truly went above and beyond for us at every step of the journey. We are so appreciative of the time and energy you dedicated to us, you simply did not stop until every last detail was perfect and the result is a wonderful family home. Thank you for everything, you deserve every success. Best wishes.